GS Yuasa Batteries has launched its brand-new GS automotive battery range. The three-tiered range, which features new battery case designs, improved performance and a fresh livery, will be available from Irish distributors Serfac Limited this coming October. Replacing the existing GS automotive batteries range, the new GS automotive line-up has been designed to meet the needs of modern vehicles. The range has been simplified, and its SMF, EFB and AGM batteries all provide superior performance and excellent value. With history stretching back to 1895, GS is the leading automotive battery brand in Asia and many other parts of the world. The launch of the new GS automotive range for the Irish and European aftermarket allows customers here to enjoy outstanding reliability and power, perfected over a century of GS battery development. James Hylton, General Sales and Marketing Manager at GS Yuasa Battery Sales UK Ltd said: “The launch of our new GS automotive range marks a real evolution for the brand. With a simplified three-tier structure, the new GS range offers the best possible performance and value for our customers whilst providing excellent coverage of the European vehicle parc. 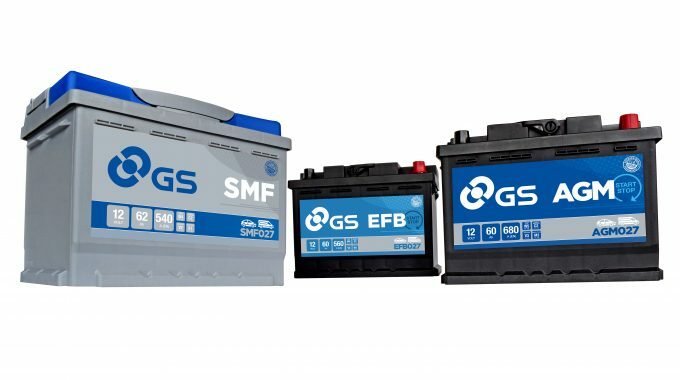 “GS is an historic battery brand firmly associated with high quality and performance. Established in 1917, GS is celebrating its 100th anniversary this year. The launch of our new, improved GS battery range is a great way to mark the occasion and look towards the future, he continued. 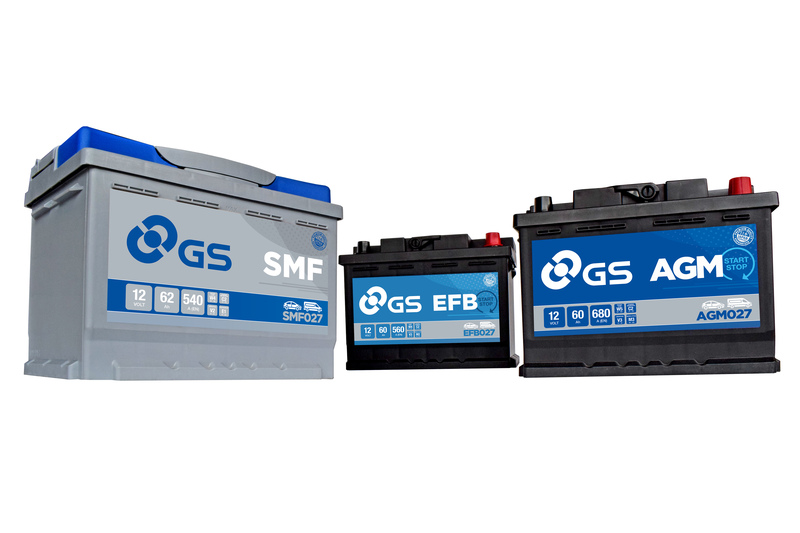 The new grey and blue GS SMF (Sealed Maintenance Free) batteries are designed for standard ignition cars and light vans. 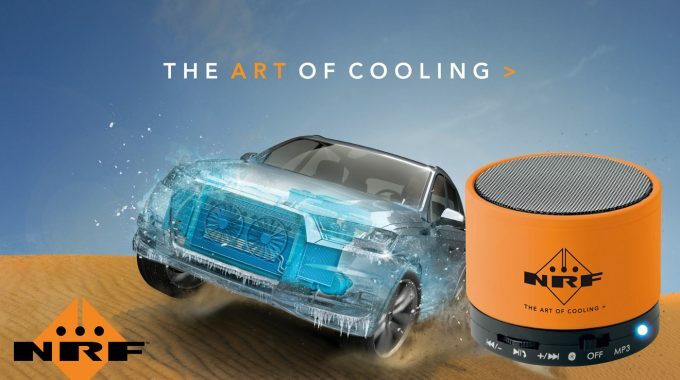 Featuring 45 references, batteries in this range provide up to 40,000 vehicle starts. They also boast a sealed maintenance free lid, Calcium/Calcium plates, a state of charge indicator plus an integrated carrying handle and flame arrestor. Featuring 8 references, GS’s new EFB range is designed for micro hybrid and Start – Stop vehicles. Each battery in the range provides high cyclic durability, increased dynamic charge acceptance and offers up to 270,000 vehicle starts. A VDA roll over test compliant sealed tip/tilt double lid reduces water loss by up to 30%, whilst Carbon/Lithium plate additives and anti-sulphation technology ensure a long service life and increased cranking power. GS’s new AGM range is designed to meet the demands of higher specification micro hybrid and Start – Stop vehicles. Its 5 Absorbed Glass Mat references each deliver approximately 360,000 starts, offer high cyclic durability and improved dynamic charge acceptance. The new GS automotive battery range is supported by a powerful trade battery lookup site – batterylookup.gs-battery.com. Based on GS Yuasa’s industry leading online battery lookup, the system is the fastest, most-accurate battery finder available and provides users with the correct battery and detailed fitting information.